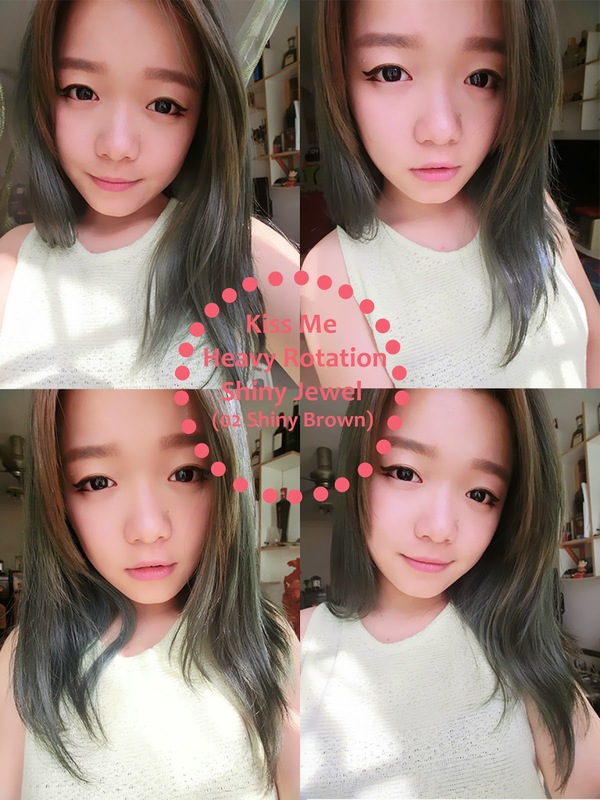 Can't deny that I am a big fans of KISS ME, all the products from them are definitely amazing! Especially in the previous post KISS ME Sunway Lagoon Beach Party, KISS ME impressed me with their super waterproof eyeliner/mascara which allowed us to bump into water and still looking flawless for the whole day! 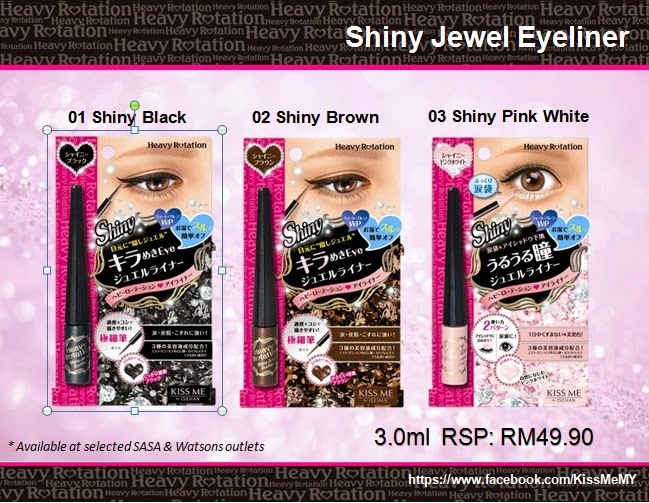 Now, I am going to introduce you KISS ME Heavy Rotation Shiny Jewel Eyeliner. 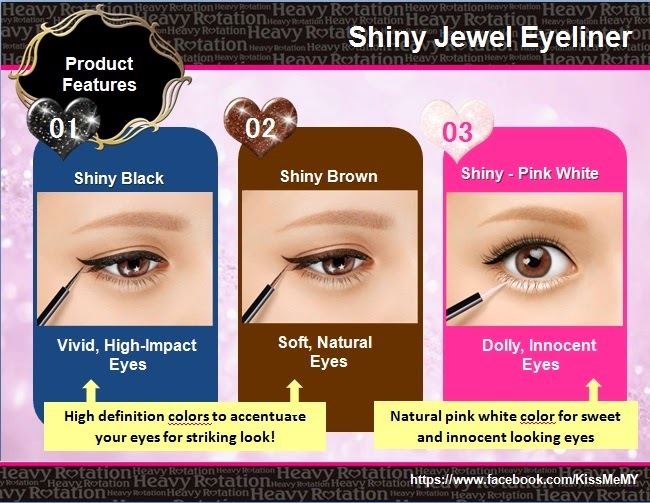 In this post, I am going to review on Shiny Jewel Eyeliner with code 02 in Shiny Brown. 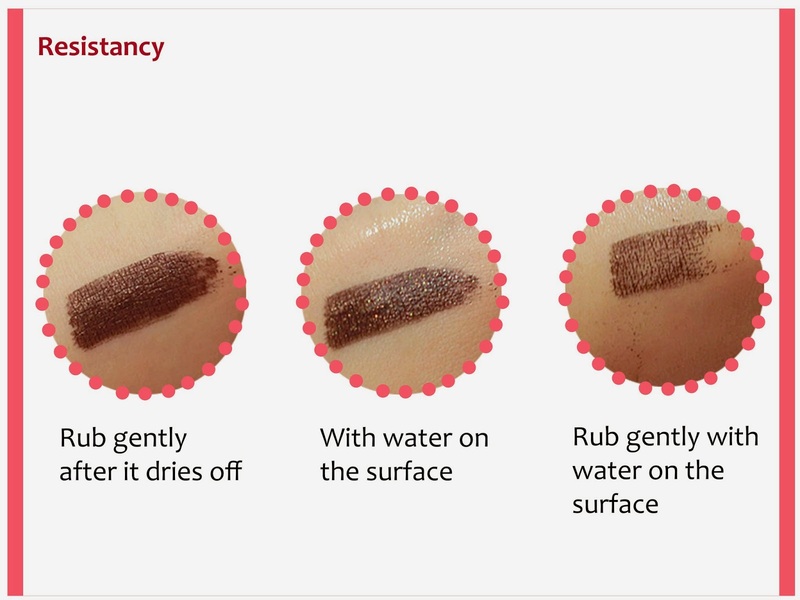 For the packaging itself, it comes with an elegant simple design, a black glitter cover cap which is specially created in cone shape as a handle for easy application (easy to control) while the bottom is a brown tube which clearly shows the color of the eyeliner. The overall size is really convenient as it's tiny enough to tuck in bag or carry around. The applicator is one of the great design which is ultra-thin brush. The design is based on the concept of easy and precise application especially when are we trying to create a define sharp lines at the inner corner of the eyes or even outer corner of eyes, best drawing sharp edges kind of eyeliners like fish eyeliners or cat eyes. Besides, it is also a liquid kind of eyeliner which consist of glitters, fantastically adding a sense of glamor to our eyes! 3 of these ingredients are food for the skin in terms of nourishment, anti-aging and moisturizing. In the picture above show 3 different results of the eyeliners under different situation which we may face sometimes. Situation 1: Sometimes we may rub our eyes because of itchiness, yet the color are still vibrant and no major effect on it! Situation 2: We may prefer wearing eyeliner when we are going to swim and tearing! It's water-resistant, so you will still looking pretty even when you are crying! Situation 3: Some people may asked, what if we rub our eyes after swimming? No worries, the eyeliner is still appeared to be there although it fades a bit (in the picture shows rubbing hardly instead of gently)! 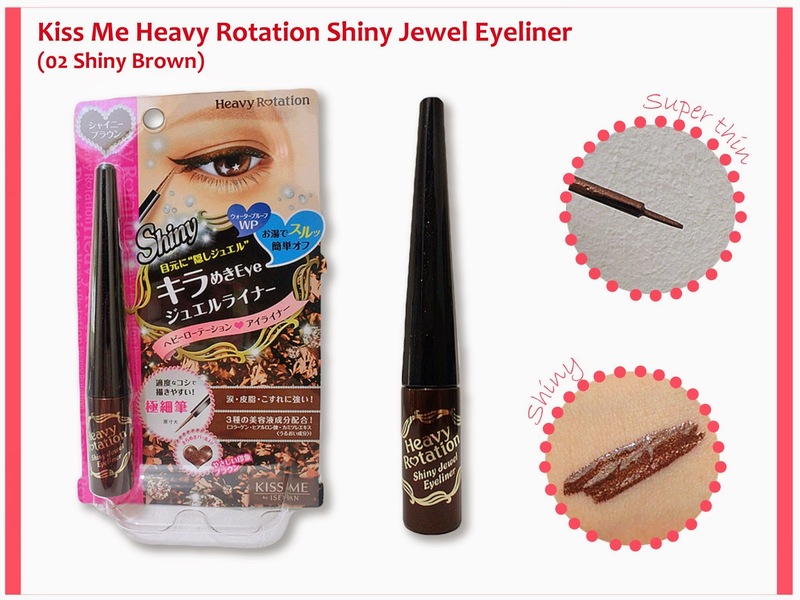 Here's a close up of my fish eyeliners using KISS ME Heavy Rotation Shiny Jewel Eyeliner (02 Shiny Brown). Instant impact shown, much more dazzling look with sharp and accurate edge! I really love how it looks on my eyes, with its super thin brush, it can easily fill up the gap in between my lashes and even drawing on lower eyelid, it shows the perfect edge! Recommended for daily casual look, not too heavy nor too light, its just nice in giving us a striking yet natural look! Besides, it's tears-, sweat-, sebum- and rubbing- resistance! 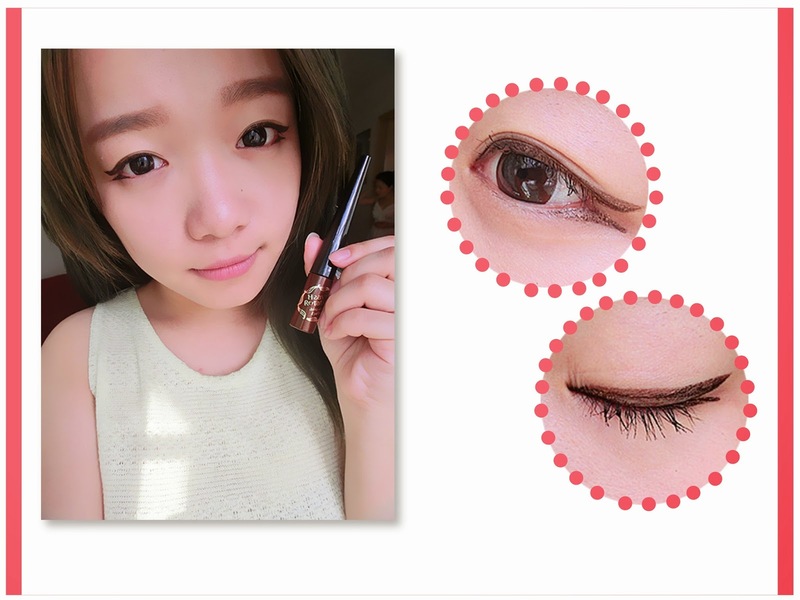 Here are the 3 different looks which can be created using 3 different shades of the eyeliners. For more information and updates, feel free to visit Kiss Me on Facebook.